Pulling into his driveway last October, Steve Springer noticed a wedding party crossing the street with plans to marry in his front yard. The couple had come from Illinois to wed outside the retired schoolteacher’s Henderson home with no advance notice. Dressed and ready for the occasion, they just asked if it would be okay. “When?” Springer asked, to which they responded, “Now.” The wedding commenced, and afterward Springer even allowed them to step into the front yard (though just barely) for a post-nuptial photo shoot. What else would you call someone who’s mounted a costly dinosaur exhibit named Shangri-La Prehistoric Park in his front yard, drawing 15,000 visitors a year? The biggest question is never “Why?” he says, but “Where?” as in, “Where did you get these?” Ours is “What?” as in, “What have you got against garden gnomes?” But that’s neither here nor there when you’re standing before a T. rex statue 20 feet in length and just about as high. Why would climate denialists and Tea Partyers like paleontology? In April of 2014, the National Museum of Natural History in Washington closed the doors of its paleontology hall. Gone were the placoderm fish, the Ice Age mammals, the hollow-boned pterodactyls. Gone especially were the dinosaurs – the Apatosaurus, Tyrannosaurus and other kings of the primordial earth. But this was no second extinction. It was evolution, a $45 million renovation project that would expand the paleontology halls to 25,000 square feet and give an outdated series of displays a desperately needed update. $35 million of that cost – the largest single gift in the museum’s history — was pledged by one David H. Koch. Nobody inspires more liberal anger than Charles and David Koch. As owners of the massive Koch Industries, a multinational energy and manufacturing conglomerate, the Koch brothers have spent a fortune bankrolling a profusion of right-wing causes. They have gained a well-deserved reputation as climate change deniers, polluters, union busters and all-round rapacious capitalists. Trace most conservative campaigns back far enough, and you’ll find them at the other end, pumping their libertarian vision into the body politic. That’s business, however. 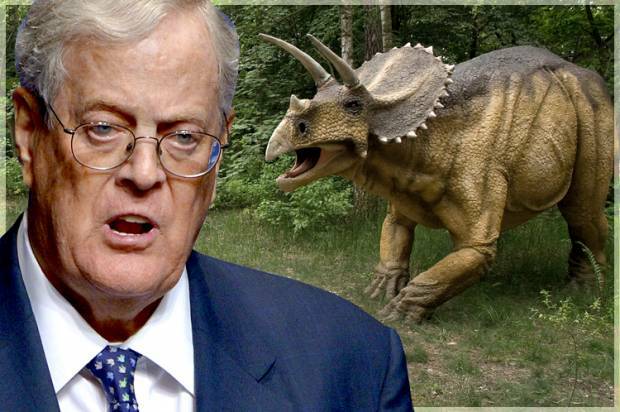 Everybody needs hobbies, and one of David Koch’s biggest hobbies, beyond his more general philanthropic pursuits, is paleontology. He has toured museums all over the world, visited dig sites in Central Africa, and funded the excavations of Don Johansen, the discoverer of the famous prehuman fossil Lucy. In an interview with the magazine Archeology, Koch excitedly recalled pulling hominid bones from the ground at Johansen’s dig site in Olduvai Gorge. He keeps a frame replica of Lucy’s hand as a trophy on his office wall, and in 2009 he funded the somewhat controversial Hall of Human Origins at the Smithsonian to the tune of $15 million. Come for the crap, stay for the fossils. Amazing array of natural history items up for auction on Saturday in Beverly Hills. ...and 357 other amazing things you never knew you wanted—until today. The dung is what is known as coprolite, fossilised feces that can provide information about an animal’s diet rather than just its appearance. It is described by Beverly Hills auctioneers I.M. Chait as an ‘eye-watering 40 inches [one metre] in length’. However, research has failed to reveal what dinosaur the excrement originated from. 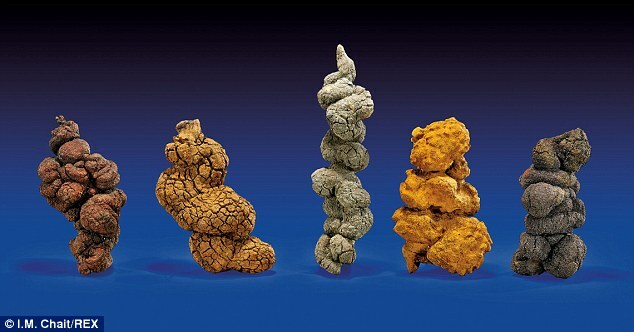 The above coprolites are a relative bargain at an estimate of about $5000 for the set. A team of local paleontologists have discovered what's been referred to as the oldest known chasmosaurine ceratopsian in Canada (try saying that three times fast…).The 77 million-year-old Mercuriceratops Gemini was officially named in a German scientific journal, and was discovered by a team of paleontologists based out of the Rocky Mountain Dinosaur Research Center. The new to us (but otherwise very old) species is known from only two species of a unique skull forming a large frill on the back of the dinosaur's skull. The first of those was found in Montana in 2007. The paleontologist who found it, Kraig Derstler, noticed that there was something different about the cheek-bone region of its skull, and he added question marks to his sketch. A man and woman, both 21, turned themselves over to N.C. State Capitol Police on Thursday in the case of the missing model dinosaur. Logan Todd Ritchey, 21, of Raleigh, and Alyssa Ann Lavacca, 21, of Holly Springs, are both charged with a felony count of the theft or destruction of the public property of a museum or a library and, additionally, conspiracy to commit felony larceny, county records state. Ritchey was held Thursday at the Wake County Detention Center on a $2,000 secured bond, while Lavacca was released on an unsecured bond Thursday afternoon, according to police. Capitol Police report that all of the missing items, including a replica of a baby duck-billed dinosaur, have been recovered. 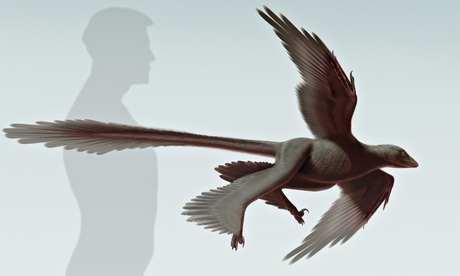 A new species of prehistoric, four-winged dinosaur discovered in China may be the largest flying reptile of its kind. The well-preserved, complete skeleton of the dinosaur Changyuraptor yangi features a long tail with feathers 30cm in length – the longest ever seen on a dinosaur fossil. The feathers may have played a major role in flight control, say scientists in the latest issue of Nature Communications, in particular allowing the animal to reduce its speed to land safely. The 125m-year-old fossil, believed to be an adult, is completely covered in feathers, including long feathers attached to its legs that give the appearance of a second set of wings or "hind wings". It is the largest four-winged dinosaur ever found, 60% larger than the previous record holder, Microraptor zhaoianus, in the family of dinosaurs known as microraptors. These beasts were smaller versions of their closely related, larger cousins, the velociraptors made famous in the Jurassic Park movies. They belong to an even wider group including the king of all dinosaurs, Tyrannosaurus rex. At 1.3 metres long and weighing 4kg, the meat-eating C. yangi is one of the largest members of the microraptor family, which tended to weigh 1kg or less. Could dinosaur DNA provide cures for serious human illness? Researchers examining the bones of a 72million-year-old dinosaur have discovered the creature had the ability to recover from serious illness and even heal broken bones. Experts have been examining the fossilised remains of a 26ft high gorgosaurus which roamed North America before its death. 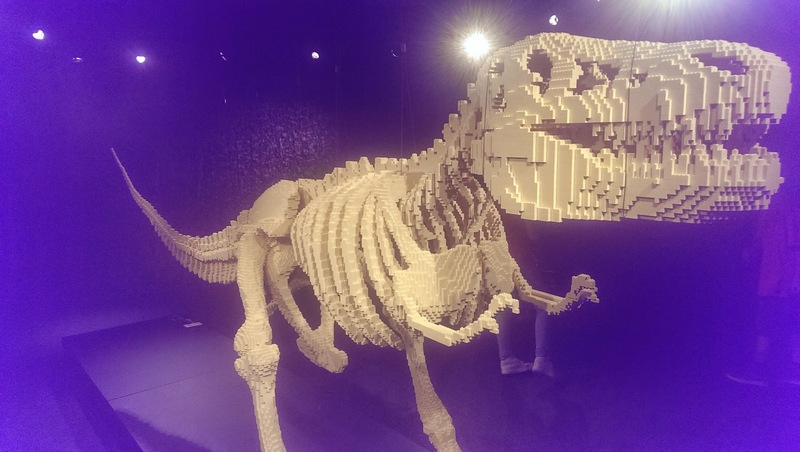 The researchers have found that dinosaur suffered several injuries in the months before its eventual death which would have been fatal for humans or mammals. Experts believe that studying dinosaur descendents such as alligators and crocodiles could provide cures for human illnesses ranging from bacterial infections to cancer. Strains of DNA which allowed the ancient dinosaur studied by the researchers may be present in the modern creatures. Among the injuries was a compound fracture of the right leg, which was healing. A bone was broken in the left leg, which had also become infected - yet it was being repaired. The animal's tail showed evidence of healing after being broken or fused due to cancer, while the beast's forearm also showed signs of being broken and healing. Unsurprisingly the beast had several broken ribs, which had also healed while a bacterial infection was eating into the jawbone. It may have even been suffering cancer. The unconventional post mortem discovered that the unfortunate creature probably died from a brain tumour. 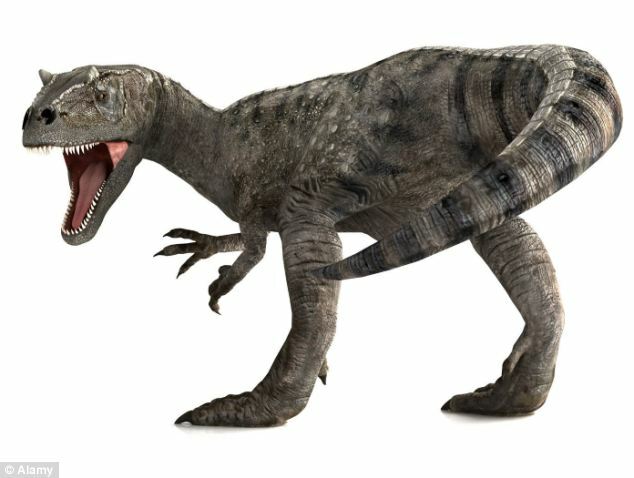 The gorgosaurus was an ancient ancestor of the Tyrannosaurus rex. OMG! Spielberg shot the last one -- not. No, superstar movie director Steven Spielberg did not poach a dinosaur and then have a picture taken showing him with his trophy kill. Hard to believe, right? Well, a photo posted on Facebook meant to be satire went viral -- being shared more than 30,000 times, because so many people not only believed it was real but also were furious at the "Jurassic Park" director. The post by Jay Branscomb on his page happened days after Facebook deleted photos from the page of Kendall Jones, a 19-year-old Texas cheerleader and hunter who posted numerous photos of herself posing with a variety of animals that she shot while on safari in Zimbabwe. The photos sparked massive outrage from animal-rights activists and other Facebook users. So, Branscomb posted the picture of Spielberg with a mechanical Triceratops on the set of "Jurassic Park," the 1993 worldwide blockbuster about dinosaurs being brought back to life, with the comment: "Disgraceful photo of recreational hunter happily posing next to a Triceratops he just slaughtered. Please share so the world can name and shame this despicable man." Many users did not get the joke and responded accordingly. "I just reported this picture. I hope you all can join me in stopping these cowards," one user wrote. And another: "Disgusting! I bet he only kept the horns!" Still, there were plenty of others who did get the joke, and had fun with it. "If this senseless poaching continues these gentle creatures may become extinct, but your $20.00 per month could help save these endangered creatures , please reach out & help the Tri-tops," a user said. It took over 111,111 generational "selections" to arrive at this "natural" selection. A new study published Monday concluded that the famous Triceratops - named and known for their three prominent horns - took around two million years of evolution to arrive at their signature form. According to the 15-year study conducted by the researchers at the Montana State University, the Triceratops did not always have the magnificent set of horns they are so well known for. The dinosaur once had a longer beak and shorter horns, which over the course of over a million years of evolution developed into a more deadly display. Year after year, researchers returned to the Hell Creek Formation in Montana where the largest specimen of Triceratops are found. Scientists have long struggled to find the relationship between the triceratops prorsus, characterized by short beak and long nasal horn, and triceratops horridus whose main feature is a long beak and short nasal horn. Scott Richardson is up at dawn, standing atop a rocky ridgeline near his base camp, a solitary figure in the slanting light. He surveys a primordial wilderness of dry creek beds and stands of juniper and pinyon pine. "This is dinosaur country," he says, gesturing toward the valley below. "There are bones all over this place." He cooks bacon on a camp stove, the sizzle breaking the silence. He then hops into his work truck for a bumpy trek deeper into the outback. He parks near a spot he wants to explore. The 58-year-old Arizona native, dressed in a wide-brimmed hat and white clothes for protection from the sun, walks past darting lizards. He swats at the maddening gnats that hover like paparazzi as he follows a closed road left to revert to its natural state.